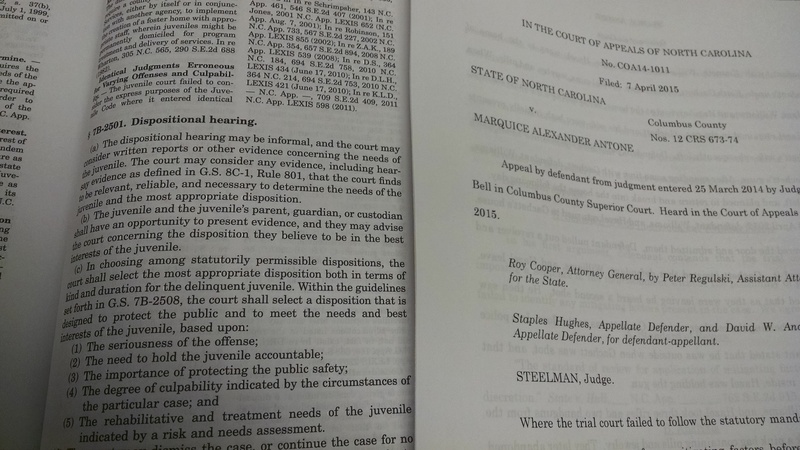 On April 7, 2015 the North Carolina Court of Appeals reversed the ruling for life without parole for Mr. Antone, a 16 year old convicted of robbery with a dangerous weapon and first degree murder (you can find the decision here). Mr. Antone, represented by Assistant Appellate Defender David W. Andrews, argued that the superior court failed to follow the statutory mandate to make findings of any mitigating factors pursuant to N.C.G.S. 15A-1340.19B. The Court of Appeals found that the language “shall” mandates that the trial court comply with the requirements of the statute. In Mr. Antone’s case, the superior court failed to make findings on several of the enumerated mitigation factors. The Court of Appeals also noted that the superior court merely recited testimony, instead of the “better practice” of making evidentiary findings of fact to resolve conflicts in evidence. There are several procedures in the Juvenile Code where this same analysis is applicable. Specifically, defenders should consider enforcing findings of fact in transfer hearings and disposition hearings. Under N.C.G.S. 7B-2203, the court is to consider eight separate and distinct factors in determining whether the protection of the public and the needs of the juvenile will be served by transfer. It is not uncommon for the court to emphasize particular factors, or not address other factors at all. Defense counsel should remind the court of its duty to consider all factors, object when the court fails to follow the statutory mandate, and preserve the record for appeal. Similarly N.C.G.S. 7B-2501 sets out factors for the court to consider in determining the most appropriate disposition. Too often the court enters a standard disposition, not considering the statutorily mandatory factors listed. Defenders should focus on the factors that individualize their client and advocate for the court to enter a disposition that is tailored to their client’s specific needs. As stated above, counsel should object when the mandated factors are not considered and preserve the record for appeal.